Thanks to improvements in the iPhone OS 3.0 software update released Wednesday, connecting to a Wi-Fi hotspot with your iPhone or iPod touch should become almost as easy as roaming on the cellular network. Two new features radically improve the process of logging in (when you’ve already got an account with the Wi-Fi hotspot provider) and filling out information when it’s required for free access. However, there are some catches, and—wouldn’t you know it?—an incompatibility or two. First the good news. Last year, AT&T granted its iPhone-using subscribers free access to what’s now 20,000 McDonald’s, Starbucks, airports, and other locations in AT&T’s U.S. hotspot network. But the process of logging in was tedious. At the hotspot, you had to enter your phone number, receive a free SMS, and then click a link to gain access. (App developer Devicescape made this process much easier via its Easy Wi-Fi apps.) iPhone OS 3.0 automates that process, not just for AT&T but for non-U.S. carriers who include Wi-Fi access in their plans. Moving beyond AT&T’s network of hotspots, iPhone OS 3.0 also adds a tool for accessing other hotspots relatively seamlessly. There are generally two kinds of public hotspots: for-fee venues that subscribers must log into; and locations that are free, but require you to load a special Web page and click a few buttons before granting you full Internet access. In the past, logging in to either type via your iPhone or iPod touch required you to connect, open Safari, and then tap in your account details or find and click an often-tiny button on each visit. The hotspot overlay appears when you connect to a new wireless network. You might think that the solution to this problem would come courtesy of iPhone OS 3.0’s new form auto-fill feature in Safari, but it’s even better than that: Safari now also includes a new feature specifically dedicated to helping you log into hotspots. Hotspots that are part of for-fee networks typically provide some basic configuration information that appropriate client software can read even before the client logs in. (This is the information used by Devicescape’s quick-login apps.) In iPhone OS 3.0, Safari now reads that same information and presents you with an overlay sheet into which you can directly enter account information or other details. The next time you return to that network, Safari can rejoin the network, logging you in with the information you entered last time. In my testing as well as that of several colleagues, it’s clear this option is better in theory than practice. 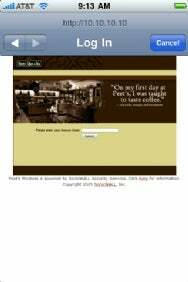 When I tried to connect to the hotspot at a Peet’s Coffee, I had to try several times before Safari finally activated the hotspot overlay. But now that the feature is there, I hope that Apple will continue to refine it in future updates. You can also choose whether or not to auto-join a particular hotspot when you return there in the future. To control this, go to Settings -> Wi-Fi and tap on the right-pointing blue arrow associated with the network. In the configuration screen, you can set Auto-Join to On or Off. Unfortunately, this setting is only accessible when you’re in range of that particular hotspot. What’s worse, this new approach also conflicts with several iPhone applications designed to let you either roam across many networks for a fee, like iPass Global Wi-Fi, or automatically connect to hotspots for you, such as Devicescape’s Easy Wi-Fi. These packages require that you first connect to a network, and then launch the application; on subsequent visits, the connection should happen automatically. But with iPhone 3.0, tapping on Cancel in the hotspot login overlay disconnects from the Wi-Fi network. Devicescape said that it has chosen to remove its applications from the App Store for the moment until the problem is resolved. The company told me that it had delivered over 1 million Easy Wi-Fi downloads, but didn’t break out which were the free or $1 Easy Wi-Fi for AT&T package, which is no longer needed in iPhone 3.0. There appears to be one exception for Wi-Fi connection packages: Boingo Mobile Wi-Fi from Boingo Wireless. The program is a connection tool for the company’s $8-per-month global Wi-Fi access service; the software itself is free to install. But when the software is installed, the hotspot login overlay stops appearing in Safari, making it possible to use the Boingo software as intended. This isn’t the case with iPass, Devicescape, or other software. A Boingo spokesperson had no specific comment on why this was the case. One possible workaround for users of other connection managers and aggregation applications might be to install Boingo Mobile Wi-Fi, even without using the software, just to disable the overlay. I wasn’t able to test that today, however, possibly due to the high volume of people using iTunes to update their iPhones and iPod touches. Apple has taken a few strong steps in simplifying hotspot connections, but the work’s not over. Heavy users of hotspots could be stymied by some of the changes in iPhone OS 3.0. Here’s hoping Apple continues to pay attention to this area and resolve the remaining problems with forthcoming software updates.